Put your organizing into overdrive, HOST or REQUEST workshops HERE!! Rosa Parks didn’t accidentally spark a bus boycott and invigorate the civil rights movement. Her training at the Highlander Folk School was a foundation for her direct action. There are many hard-won lessons, innovative tactics, and success stories we ought to learn from our comrades. We are excited to help you amplify your activism and reenergize your engagement with a new set of skills and tactics! Enhance your impact and escalate your campaigns to victory! HOST or REQUEST workshops HERE!! [Be sure to check out Bill Moyer's recent essay Reflections on the Beauty and Power of Kayaktivism HERE.] Backbone Campaign is the home of Kayaktivism. In the Spring and Summer of 2015 Backbone trained approximately 400 Kayaktivists. We organized and supported 14 separate Kayaktivist actions and helped launch the Kayaktivism meme that is spreading across the globe! If you wish to bring a Kayaktivist training in your community, neighborhood, workplace, or campus, then submit your request HERE. Request this Workshop ! Non Violent Direct Action 101 Core Foundations & Direct Action: (4 hours) Request this Workshop ! Core Foundations: (2.5 hours) Grand Strategy is an exploration of principles of strategy, domains of conflict, and the relationship between the physical, mental and emotional game of drawing power to a cause. Moyer applies the work developed in Sun Tzu's Art of War and updated by Col. John R. Boyd to building power through nonviolent social movement. Request this Workshop ! Artful Activism & Creative Tactics Core & Artful Activism: (1.5 Hours) Request this Workshop ! Action Planning Direct Action: (2 hours) Request this Workshop ! Know Your Rights Direct Action: (2 hours) Request this Workshop ! Giant Banner Building & Overpass Bannering Artful Activism: [ (1/2 Hour +) Request this Workshop ! Projection as Protest Artful Activism: (1/2 Hours +) Request this Workshop ! Overpass Light Brigade Artful Activism & Imagery Building (1/2 - + Hours) Request this Workshop ! 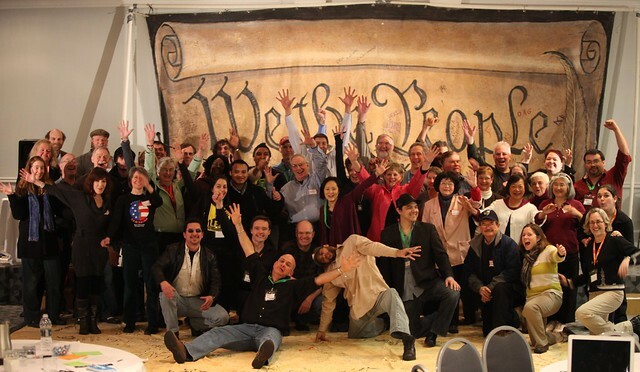 Flashmobs Artful Activism: (5+ Hours) Request this Workshop ! Introduction to Blockades Direct Action: (3 Hours) Request this Workshop ! Advanced (Hard) Blockades Direct Action: (3 hours) Request this Workshop ! Tripod Climb Training & Direct Action: (4 Hours) Request this Workshop ! Strategic Campaign Planning & Avoiding Burn Out Core & Direct Action: (2.5 Hours) Request this Workshop ! Action Scouting Direct Action: (2 hours) Request this Workshop ! Papier-mâché Puppet Imagery Build Artful Activism: (6+ Hours) Request this Workshop ! Drumming For Demonstrations Artful Activism: (1-3 Hours) Request this Workshop ! Additional Trainings (Descriptions Coming Soon) Request this Workshop ! Grand Strategy is a signature workshop of Backbone that articulates a set of strategic principles and a frame through which our social movement can assess the effectiveness of the tactics we deploy in order to achieve our ultimate goals and vision. Request this Workshop ! Fill out the quick form below to Host or Request these workshop offerings.